Our Metal Book Carts feature extra sturdy construction for displaying and transporting your literature around your school, office, or public library. Rolling casters with built-in brakes smoothly adjust to uneven terrain, and we offer single and multi-shelf models in a number of designs for stress-free, drop-free transport. 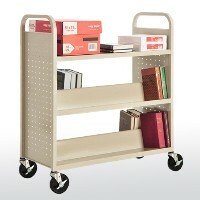 Buy a Metal Book Cart today for optimal durability and stability in your library or bookstore.